If you watched the first installment of Polar Bear Town on the Smithsonian channel, you won’t need convincing to tune in for the rest of the series. If you’re just joining the docu-series, here’s what you’ll see in subsequent programs. Mother bear will show her cubs how to hunt seals. Testing the ice as Hudson Bay freezes. A mother bear is leading her nine month-old cub back from his first hunting season on the ice. Now, they’ll face an even more daunting challenge: throngs of tourists descending on Churchill, which could put the cub and themselves at risk. Veteran guide Dennis Compayre takes on an apprentice, Andrea Dillon, but an aggressive client might complicate her “baptism by bear.” And fellow guide Kelsey Eliasson flips the script and takes up a camera himself to assist in a groundbreaking research project that identifies bears through their unique whisker patterns. Bears spar with each other to learn defensive skills. Polar bear season has reached its peak and Brian Ladoon is looking for help at his Mile 5 Dog Sanctuary. Brian can’t be in two places at once – feeding his Canadian Eskimo dogs and on the lookout for polar bears. Luckily, volunteer Russell Hausler has traveled from Australia to give Brian a hand. But Russell is not experienced in the dangers of Polar Bear Town and he may end up doing more harm than good for Brian and the dogs. Meanwhile, bear guide Dennis Compayre and regular client, California photographer Andrew Bazeley, are looking for the perfect shot to complete Andrew’s book. They encounter a pair of polar bears that locals call the Scrappy Brothers, because they wrestle each other to hone their skills for mating battles to come. And a cub called Curious ventures away from its mother and finds itself on a dangerous collision course with a hungry but elderly male known as St. Pete. Halloween has arrived in Polar Bear Town. 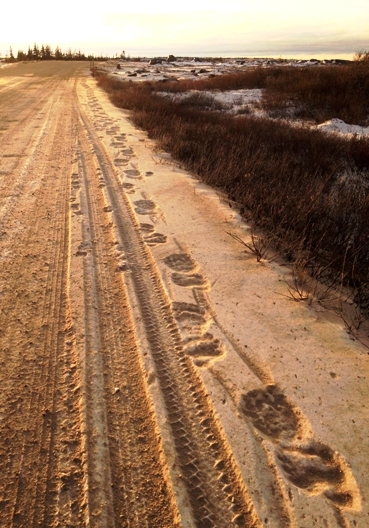 It’s the worst day of the year for bears in Churchill and the busiest for conservation officers. Children are trick-or-treating and people like Erin Greene are attending parties. Last year, Erin was on her way home from a party when she was attacked by a polar bear. Erin survived the attack but is afraid that it could happen again. Erin enlists her friend, bear guide Karine Genest, to confront her fears by getting close to a polar bear for the first time since the attack. While humans are understandably fearful, the bears are even more at risk. New Mom follows her nose into a bear trap and separates herself from her cub, whose very survival may depend on Kelsey’s intervention. facility until they are released back into the bay area. about polar bears in and around Churchill. ﻿And a roaming Big Bear is headed directly toward the army of guards protecting town. ﻿﻿﻿﻿Winter has settled in on Churchill. It’s the time of year when conservation officers release bears from its polar bear holding facility, which the locals call “Polar Bear Jail”. A special release sees a mother polar bear and her cub airlifted out of town, to be safely released in the wilderness. Kelsey has special access for the release and follows along in a chase helicopter. But the tranquilizers that conservation officers use on bears wear off quickly and the helicopter pilots need to find a place to land before the bears wake up. Meanwhile, Dennis Compayre enlists some friends to help him find a special bear called Dancer, whom he’s known for over 20 years. It’s spring in Churchill. While most polar bears are now hunting for seals on the frozen Hudson Bay, pregnant females have migrated south to their ancestral dens to give birth. The race is on for guides, photographers and scientists to find hidden denning sites outside of Churchill, in hopes of seeing mothers and cubs emerge. Inside one of those dens, a mother bear has spent three full months nursing her cubs. At around 20 pounds each, they’re nearly ready to leave the den and embark on the epic trek to their icy hunting grounds. And a team of biologists, including Don Moore of the Smithsonian’s National Zoo, make an astonishing discovery – a maternity denning complex that a group of polar bears has used for generations.